By TruePublica: In this article, we have attempted to identify the most censored stories of modern times in Britain. We have asked the opinions of one of the most famous and celebrated journalists and documentary film-makers of our time, a high-profile former Mi5 intelligence officer, a veteran journalist of the Iraq war, a gagged ex-army medic along with the head of one of the worlds largest charities. So true have we found this statement to be that we’ve had to split this article into two categories – military and non-military, with a view that we may well categorise surveillance and privacy on its own another time. Without further ado – here are the most censored military stories in Britain since the 1980s, that we can publish – in no particular order. Do bear in mind that for those with inquisitive minds, some of these stories you will have read something about somewhere – but to the majority of citizens, these stories will read like conspiracy theories. Before the full-scale British/American led attack on Iraq in 2003-11, a US, UK and UN sanctions regime was imposed on Iraq on the pretext of denying Saddam Hussein the materials necessary to make weapons of mass destruction. Items banned from Iraq under this rationale included a vast number of items needed for everyday life. Undisputed UN figures have since shown that 1.7 million Iraqi civilians died due to the West’s brutal sanctions regime, half of whom were known to be children. The mass death was seemingly intended. Among items banned by the UN sanctions were equipment essential for Iraq’s national water treatment system. A secret US Defence Intelligence Agency (DIA) document discovered by Professor Thomas Nagy of the School of Business at George Washington University amounted to what he said was: “an early blueprint for genocide against the people of Iraq”. This means that in Iraq alone, the US-UK killed 1.9 million Iraqis from 1991, then from 2003 onwards another 1 million in the attack of Iraq: totalling just under 3 million Iraqis dead in two decades. In May 2013 the reputable polling company ComRes asked a representative sample of the British public the following question: “How many Iraqis, both combatants and civilians, do you think have died as a consequence of the war that began in Iraq in 2003?” According to 59% of the respondents, fewer than 10,000 Iraqis died as a result of the war. The Britsh media totally ignored this story. How’s that for manipulating the minds of the masses? For years, journalists and researchers have speculated about what really goes on inside Menwith Hill in North Yorkshire, while human rights groups and some politicians have campaigned for more transparency about its activities. Documents revealed by The Intercept showed how the NSA used the British base to aid “a significant number of capture-kill operations” across the Middle East and North Africa, fueled by powerful eavesdropping technology that can harvest data from more than 300 million emails and phone calls a day. The NSA pioneered groundbreaking new spying programs at Menwith Hill to pinpoint the locations of suspected terrorists accessing the internet in remote parts of the world. The programs — with names such as GHOSTHUNTER and GHOSTWOLF aided covert missions in countries where the U.S. has not declared war. The disclosures about Menwith Hill raise questions about the extent of British complicity in U.S. drone strikes and other so-called targeted killing missions, including many civilians deaths, which may in some cases have violated international laws or constituted war crimes. South Africa operated a covert nuclear ballistic missile program in the 1980s. The United Nations introduced a mandatory arms embargo against South Africa in the development and manufacture of such weapons. The result was that nine nuclear weapons were left after testing. David Cameron bought and sold with taxpayers money three of those nuclear weapons, put them in unsafe hands in the Middle East and the Conservative party banked nearly £18 million. These weapons were not only stored unsafely in the Arabian peninsula but were stored in a volatile region, which subsequently went missing. Margaret Thatcher was asked to sign off these weapons in late 1990 under a special Urgent Operational Requirement (UOR) describing them as metal cylinders rather than nuclear bombs. Dr David Kelly (remember him?) was the only person in mainstream UK MOD tasked with being in the loop for that covert offshore procurement of battlefield nukes from Apartheid South Africa. Using money from the Ministry of Defence (MOD) to acquire the weapons, it was subsequently revealed later that £17.8 million was syphoned from this secret nuclear deal into Conservative Party funds. No wonder this story was kept under wraps. According to the International Committee of the Red Cross and the International Criminal Court (ICC) – The “employment of a thermobaric weapon against a population is about half of a war crime.” It is described like this because the international community has yet to officially name them as cruel weapons against the spirit of just about every law of war that exists. In other words, these weapons, awful as they are when they explode, are chemical weapons if they fail to go off. The Ministry of Defence revealed for the first time – accidentally, just a few months ago – that British drones are firing thermobaric weapons in Syria. 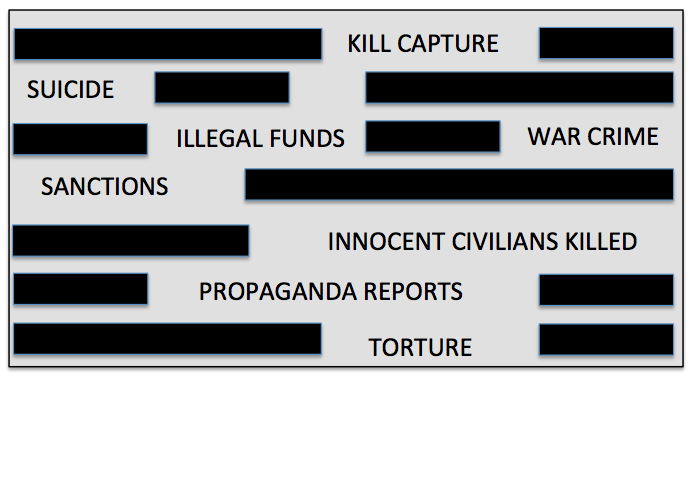 The disclosure comes in a Freedom of Information (FoI) response to Drone Wars detailing the use of Reaper drones over the previous three months. David Kelly (the same one as above) was an authority on biological warfare, employed by the British Ministry of Defence, and formerly a weapons inspector with the United Nations Special Commission in Iraq. Kelly was found dead two days after a parliamentary Foreign Affairs Select Committee interrogated Kelly about the so-called ‘dodgy dossier. The upshot was that Lord Hutton’s decision to classify documents about the death of Dr David Kelly faced claims of a whitewash amid claims by experts that there are increasing grounds to question the inquiry’s verdict of suicide. The Hutton inquiry, which reported in 2004 that Kelly’s death was suicide after he cut an artery in his wrist, came under scrutiny from doctors who claim the medical account is improbable. Hutton subsequently ordered the documentation surrounding Kelly’s death, including the pathology reports and witness statements – to be classified for 70 years. Although Freedom of Information experts all agree there are strong grounds to release the documents – every angle, including legal challenge has been rejected. “This is a revelation,” said Michael Powers QC, a former assistant coroner and expert in coronial law. “I can’t think of anything that would justify these documents being treated any differently.” These documents have also been classified for twice as long as documentation of national security. Questions have remained around the death of Dr Kelly after the initial inquest into his death was never resumed. In addition, the Hutton enquiry used a less stringent test than would have used in an ordinary inquest raising further suspicions that Dr Kelly was in fact murdered. Under these conditions, none of us living today are likely to hear what actually happened. The Pentagon gave a controversial British PR firm over half a billion dollars to run a top-secret propaganda programme in Iraq making fake videos of Al Qaeda atrocities, partly to keep taxpayers cash rolling in as the general public became more war-weary over time. Bell Pottinger’s output included short TV segments made in the style of Arabic news networks and fake insurgent videos. The company was one of Britain’s most successful public relations organisations and was credited with honing Margaret Thatcher’s steely image and helping the Conservative party win three elections. Bell Pottinger’s work in Iraq was a huge media operation which cost over a hundred million dollars a year on average. Documents unearthed shows the company was employing almost 300 British and Iraqi staff at one point. Transactions worth $540 million between the Pentagon and Bell Pottinger were recorded for information what they termed ‘operations and psychological operations’ on a series of contracts issued from May 2007 to December 2011. The disgraced PR firm has since gone bankrupt over a series of scandals, including stoking up racial tensions in South African elections. Had it not been for a whistleblower, this story would not be known at all today. The White Helmets brand was conceived and directed by a marketing company named “The Syria Campaign” based in New York. They have managed to fool millions of people. They recently won a 2016 Right Livelihood Award and Netflix released a special ‘documentary’ movie about the White Helmets. The Guardian and others even called on the Nobel Committee to award the 2017 Nobel Peace Prize to the White Helmets. They stole the name Syria Civil Defense from the real Syrian organization. They are not independent, are funded by governments that want regime change and are not apolitical. They do not work across Syria but only work in areas controlled by the armed opposition, mostly Nusa and Al Qaeda. Dozens of reports have emerged about how this group carry weapons and make publicity and propaganda videos. The Swedish Doctors for Human Rights even demonstrated how the White Helmets were seemingly happy watching a baby die simply to make a video. (Viewer discretion – report and video HERE). The real Syrian Civil Defense force works on a shoestring budget with real volunteers without a video team accompanying and promoting them. Most in the West are unaware that the 60+ year old Syrian Civil Defense team continues to work with absolutely no recognition. Sadly, the White Helmets would sit very comfortably in another story in this report where it was found that the Pentagon paid a British PR company hundreds of millions of dollars to produce fake al Qaeda videos. It also fits nicely with the fact that the Syrian Observatory is funded by The Foreign Office and that Britain’s Conflict, Stability and Security Fund feeds the White Helmets millions in taxpayers money. Irrefutable, hard evidence came forward that totally destroyed the story of chemical weapons attacks by the Syrian government over its own people in Douma. Twice winner of the British Press Awards‘ Journalist of the Year prize, and seven-time winner of the British Press Awards’ Foreign Correspondent of the Year, Robert Fisk, a Middle East correspondent since 1976 and since 1989 has been correspondent for The Independent, managed to make his journey unaccompanied by Russian or Syrian officials – to Douma. This is the site of the so-called attack that the US, UK and France decided was enough evidence to be the pretext for attacking a sovereign state that could have escalated into something much worse – a major conflict with Russia, Iran and even China. Fisk was subsequently persecuted by his peers in the mainstream media and this important story largely went unreported. It is no coincidence that the media has just reported that there are: “Allegations that the US government has intervened to censor a report into rendition and torture by UK spies.” Dominic Grieve, chair of the intelligence and security committee attacked the government, accusing it of acting “unacceptably” by leaking the report to the media (presumably for political reasons). Over the past few years, increasing evidence has come to light of UK knowledge of, and involvement in, the CIA’s post 9/11 programme of extraordinary rendition and torture and in attempts to use information obtained through the use of torture as evidence in UK courts. This was backed up in recent years by a number of people who have been subjected to torture and other ill-treatment in Guantanamo Bay, Afghanistan, Pakistan, Egypt and Morocco and elsewhere who have alleged that UK officials actively assisted their abusers. There is also evidence that UK officials have passed on information to their American counterparts which was then used in abducting and subjecting people to extraordinary rendition and in torture interrogations. The terms of the inquiry referred to above made sure that the Government’s most senior civil servant and not a judge presided – nothing less than the use of closed courts and secret evidence. It is clear that extraordinary steps have been taken to keep any information about possible UK complicity of torture secret. We may never know the full extent of rendition and torture conducted by the United Kingdom since 9/11. The UK has surrounded its use of armed drones with secrecy. The government is refusing to provide key documents even to the secretive Intelligence and Security Committee. Committee Chair Andrew Tyrie told that Guardian that without the documents the committee would not be able to do its job when it was investigating the illegal extra-judicial killing of a British subject in Syria under the Cameron government. Another key secret is where Britain’s armed drones are based and where they are actually operating? While the UK currently has a fleet of armed Reapers, the MoD refuses to say how many or where they are located, arguing that security concerns prevent disclosure. No such security concerns affect other UK aircraft. The real reason for the secrecy is that the UK wants to be able to operate them covertly just as the US does on kill missions in countries where no war is being conducted and where no permissions exist for their use in those countries. We are simply not allowed to know. Armed drones and the idea of ‘risk free warfare’ is a growing danger to global security and is a myth perpetuated by the UK and US governments. In 2014 it was known that of 41 human targets identified to be killed by drones – 1,147 innocent civilians died as a result. This means that for every designated kill, over 30 completely innocent civilians are killed just for the crime of being in the wrong place. These are just some of Britain’s most censored stories. There are so many of them that we have had to categorise them, which says something about how democracy, free speech, civil liberty and human rights are performing in Britain right now.